SecuraSoft ™ MSG to EML Converter is a comprehensive tool to convert MS Outlook MSG file content to Outlook Express EML format securely without any data loss. Support Bulk migration of MSG files to EML Format. Tool convert MSG File of any size to EML Format. Support all editions of Wndows OS. 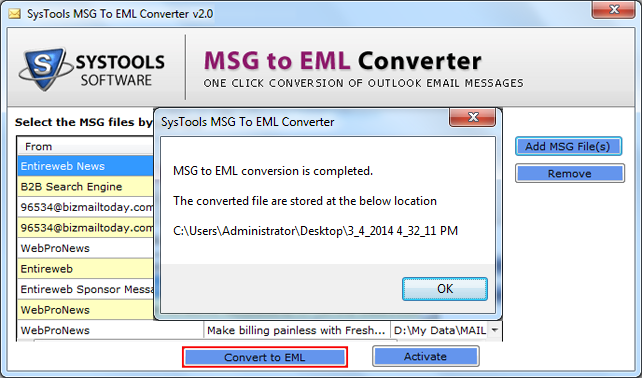 MS Outlook installation is not required for MSG to EML conversion. 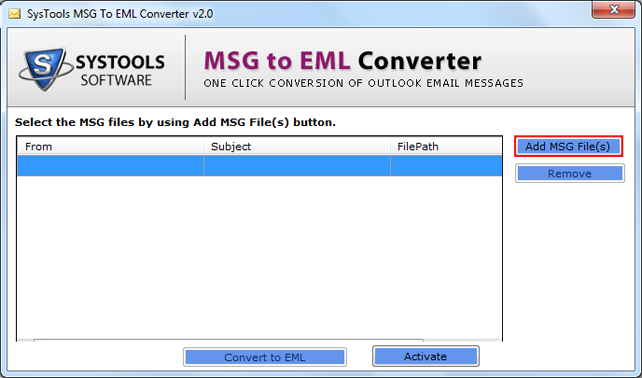 Convert messages from MSG to EML format along with attachments. Export MSG to EML by sorting all the emails according to properties Such as To, From, subject, email sent, received date, size, location of file in an ascending or descending order. You can re-arrange the emails in MSG format according to requirement. Converted Emails in EML format can be opened and read in multiple email clients like Mozilla Thunderbird, Outlook express, Windows Live mail etc. Tool used to Import MSG to EML file format support number of emailing softwares to open the converted EML files. While converting MSG to EML file format meta properties like To, From, cc, bcc, attachments ,subject, images and font are preserved. Conversion tool perform conversion without affecting the meta attributes. User does not have to go to multiple screens for using any of the feature provided by tool that convert Outlook MSG to EML. All the options and features are consolidated on one screen. 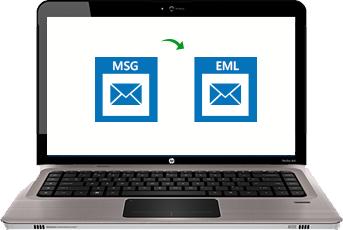 MSG TO EML Converter provides support to convert multiple MSG files to EML format. User can transfer all the MSG files to EML simultaneously in batch mode. Users can change the path/location as per user need and convenience. User can directly select target location to save converted EML files.. I used this tool to convert Outlook 2010 MSG to EML file format. A Very reliable software and a kind of time savior. It provides a very easy to use interface.Even a Non technical person can understand its working .Thank you so much team for providing a product guide describing all the steps for using the software. A perfect tool to migrate 500 emails in MSG format to EML . Just few clicks and emails in MSG extension migrated to EML format without any data loss. I am totally satisfied with the software.Thanks team!! I used it to convert messages along with attachments to EML format. I am really happy as none of the attachment is lost. 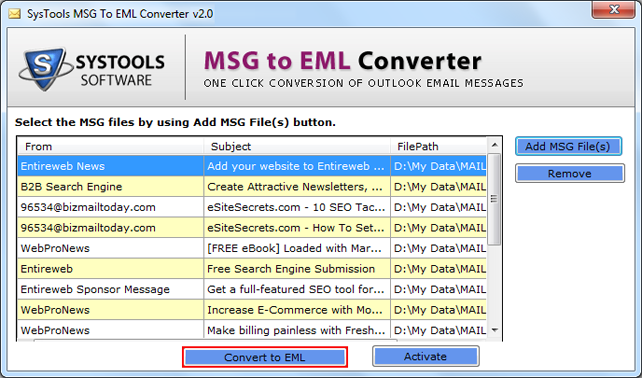 It is one of the best tool to convert Outlook MSG file to EML format. SecuraSoft MSG to EML Converter is a very amazing software as it securely migrate all the emails from Outlook MSG to Outlook express PST format. It comes with affordable price and with user friendly interface. MSG File Format is file format used by Outlook to store single email message. To create an MSG file drag-and-drop the item like email in Windows Explorer. EML is a file extension is used by Microsoft Outlook Express to store e-mail messages. EML file is a plain text file. It contains e-mail addresses of the sender and the recipient, the subject, and the time and date of the message, body of message, attachments. Preserve the email meta attributes of converted EML File Format. Convert MSG file to Outlook Express EML format without Outlook installation . MSG file of any size can be converted to EML Format. Save converted EML File according to user specified Location.